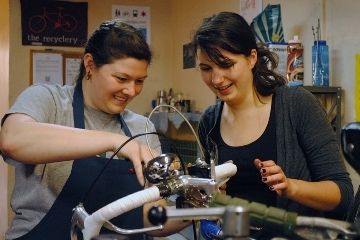 We teach bicycle maintenance through our introductory Tune Up class and our more advanced Overhaul Class. These classes are for adults. Pay for a class below to sign up! Email us if you cannot afford the full amount. You may also pay at our shop, but you are not registered until we receive payment. If less than four people register for a class, we generally try to reset the class dates for the near future. If you are not available for the reschedule dates, we will cancel and return payment. Otherwise, there are no refunds for registration fees. The Overhaul Class is somewhat cumulative; each week the topics build on knowledge gained in the previous week. If you have to miss a session we will make an effort to catch you up in the free hour before class the following week, but if you miss several classes in a row you risk falling behind. We’ll also provide new cables and housing for the this class. Tune Up Classes are generally held Sunday evenings 6-9 PM and Overhaul Classes are Sunday afternoons 2-5 PM.